Through a wide range of course offerings the Department of English seeks to develop each student’s capacity for reading — the intense, concerned involvement with textual expression. Short Term 2016 Medieval Reenactment class taught by Sylvia Federico. 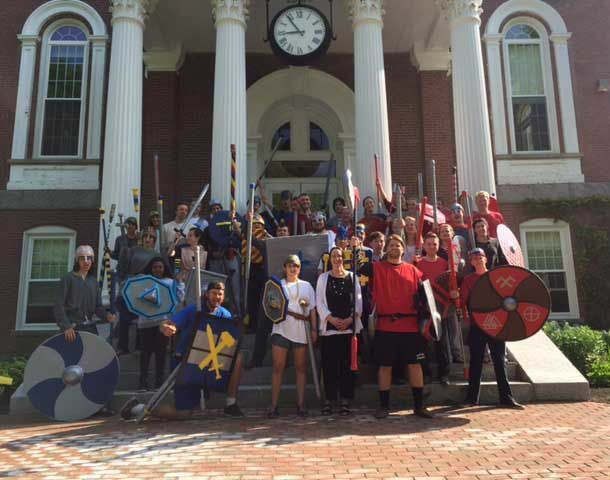 Students brought “The Battle of Maldon,” to life, based on the short poem commemorating the 991 battle between native Britons and an invading Viking army. All courses are intended to foster critical reading, writing, and thinking, in which “criticism” is at once passionate appreciation, historical understanding, and the perpetual rethinking of values. More specifically, the English major prepares students for careers such as teaching, publishing, and writing, for graduate study in literature, and for graduate programs leading to the study or practice of medicine or law. Though the department embodies a variety of teaching styles and interests, the faculty all believe in the art of patient, engaged reading as both knowledge and pleasure. Departmental offerings are intended to be taken in sequence. Courses at the 100 level are open to all students. Courses at the 200 level are more difficult in both the amount of material covered and the level of inquiry; they also address questions of theory and methodology in more self-conscious ways. Most 200-level courses have prerequisites. Seminars at the 300 level are generally for juniors and seniors who have completed several English courses (the latter requirement may be waived at the discretion of the instructor for certain interdisciplinary majors).